My kids love burgers. It doesn't matter what type, they will eat them. My husband and I are also burger fans and I make them at least once every couple of weeks. I try to change up the type of meat I use since I make them so frequently. Some weeks I use pork, some chicken and occasionally beef. I try to make sure that the beef burgers that I make have something special since beef burgers can be a little boring and often dry. 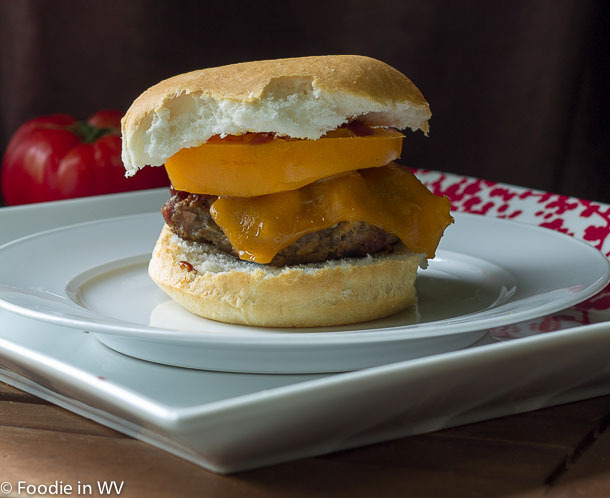 Pineapple is an add-in that my family loves in burgers and it is great with beef. This week I tried a new recipe for Hawaiian Burgers from the August 2012 issue of Better Homes and Gardens magazine. This recipe has 12 ingredients. It takes 30 minutes of total time, all of which is active and makes 8 servings. I did make a few changes. First I made my own buns. I ate gluten free buns and the rest of my family regular hamburger buns. Lettuce isn't a popular burger topping in my household, so I left it off. I used leftover ham that I had from a recipe a few weeks back and had then frozen.. Finally I grilled the burgers on my indoor electric grill. They took slightly longer than the recipe suggested, but that is normal when using an indoor grill. My kids really loved these burgers. They can be hit or miss on what they will eat, but they really liked this recipe. The burgers turned out very juicy from the pineapple and blue cheese, without being overpowering. I was worried that since the recipe had so many ingredients in the burger that it would taste too busy, but the flavors ended up working perfectly together. For the recipe go to Hawaiian Burgers. Oh man, I never would have thought to use pineapple and ham alongside my burger, but I eat that combo on my pizza, so why not a burger? I'm a burger lover too and have a few Hawaiian burgers myself here in NYC. Love the pineapple for a touch of sweetness. I agree that pineapple is great for adding sweetness to burgers! I am a big fan of pineapple with burgers. Most excellent. Am a BIG fan of burgers too and now have a craving for this one and for Hawaiian foods too! Sounds like a good burger! Thank you for sharing with Foodie Friends Friday!